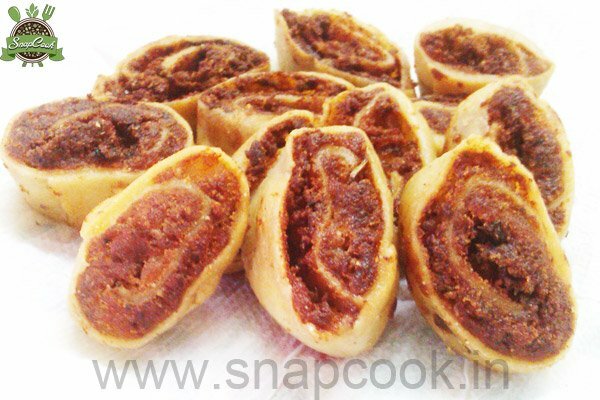 Bhakarwadi is a traditional Maharashtrian snack, crispy, tangy in a desi style. Makes around 30-35 small bhakarwadis depends on size. Add flour, refined, ajwain and salt in a mixing bowl. Mix well, then add water little by little and make stiff dough. Cover and keep aside for 15 minutes. Knead again to form smooth dough. Make the filling mixture, mix all the ingredients together except gram flour. Now take kadai and fry gram flour till it raw smell goes off and then potato mixture and fry it for 2-3 minutes and keep aside. Now, Smear your palm with little oil. Take a big lemon sized dough and roll into a big roti. .
Now spread potato mixture all over it and roll it with the filling into a cylindrical shape. Cut the roll into pieces of around 1 inches each. Heat required oil in kadai and hot it. Now simmer the gas. Now add bhakarwadi in the batches of 7-8 and deep fry on low flame till golden yellow in colour. Drain on a tissue and serve it hot and crispy.